The Connecticut Humane Society is the oldest and most comprehensive animal welfare organization in the state and helps thousands of pets every year. We envision a Connecticut where each companion animal finds a permanent, compassionate home, where communities are enriched by the special bond between people and animals, and where animal cruelty no longer exists. 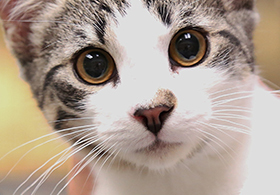 The Connecticut Humane Society is dedicated to providing the pets who come to us the best care and training during their stay and after they go home. It takes a community working together to save pets’ lives, and the Connecticut Humane Society is proud to partner with local animal control departments to help them expand their work. Many animal control officers (ACOs) are doing the very best they can to stretch limited resources and tight town budgets. Through CHS’ ACO Medical Support partnership, CHS is able to support these ACOs and municipal shelter pets by performing spays and neuters, urgent surgeries and more, completely pro bono! CHS’ partnership also allows animal control pets to transfer to CHS for adoption. The high foot traffic gives them a boost in finding new homes and helps free up the ACOs to respond to more animals in need. Remember: If you’re concerned about animal welfare in your community, contact your local ACO to report stray dogs and any suspicion of cruelty and neglect. Special thanks to the Grey Muzzle Organization for its support of CHS’ pro bono veterinary care for senior dogs from ACO partners. In an effort to further support ACOs and their work, here are some of the available pets at local animal control offices with information on how to meet them. Available at the Little Guild. Available at New Haven Animal Control. Available at Meriden Animal Control. The following is a list of local animal control partners. Please visit these links to connect and to view their adoptable pets.